Analysis: Once again, Theo Riddick, LeGarrette Blount and Zach Zenner will share some extra touches to go around in a hard-to-pinpoint situation. With the Lions' season essentially over and only two weeks left on the slate, Johnson is starting to run the risk of getting shut down until 2019. Analysis: Not that there was much question in the first place, but this essentially ensures the rookie running back will miss a fourth straight game. LeGarrette Blount, Theo Riddick and Zach Zenner are likely to form a three-headed committee Sunday in Buffalo. Johnson (knee) isn't participating in Thursday's practice, Dave Birkett of the Detroit Free Press reports. Analysis: With no recorded on-field activity since he sprained his left knee Nov. 18 against the Panthers, Johnson looks bound to miss a fourth consecutive game Sunday against the Bills. Assuming that's the case, LeGarrette Blount will continue to act as the Lions' lead option on the ground, while Theo Riddick has unfettered access to the passing-down work out of the backfield. 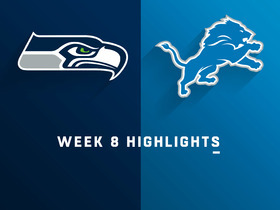 Johnson (knee) didn't practice Wednesday, Tim Twentyman of the Lions' official site reports. Analysis: Johnson is off to a poor start in his effort to avoid a fourth consecutive absence while nursing a knee sprain. 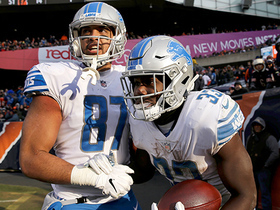 The Lions split backfield work between LeGarrette Blount, Zach Zenner and Theo Riddick during Sunday's 17-3 win over the Cardinals, and they're likely prepared to do the same Week 15 at Buffalo. Johnson (knee) has been ruled out for Sunday's game in Arizona. Johnson (knee) was not spotted during the portion of Friday's practice open to the media, Justin Rogers of The Detroit News reports. Analysis: It's looking like Johnson will miss practice for a third day in a row, an indication he will miss his third game in a row. The Lions will reveal whether or not the door is open for Johnson to take the field Sunday at Arizona when their final injury report of the week becomes available. Johnson (knee) was held out of Thursday's practice. Analysis: A mere spectator during the portion of the session open to the media, Johnson has yet to make any inroads toward a return from a sprained left knee. He does have one more chance to take the practice field this week, but he appears to be trending toward a third missed game in a row. in Johnson's stead, the backfield has been led by Theo Riddick (67 snaps on offense) and LeGarrette Blount (63) in their traditional roles. Johnson (knee) isn't participating in the open portion of Thursday's practice, Tim Twentyman of the Lions' official site reports. Analysis: Johnson is thus in line for another non-participation listing on Thursday's practice report. Unless he fits in some activity Friday, Johnson will likely be ruled out ahead of Sunday's game in Arizona, which would mark his third consecutive absence. LeGarrette Blount would again be in line for the bulk of the carries out of the backfield, while Theo Riddick would see the overwhelming share of snaps on passing downs. Johnson (knee) didn't practice Wednesday, Dave Birkett of the Detroit Free Press reports. Analysis: The rookie running back is off to a poor start in his bid to avoid a third consecutive absence. Given that he's recovering from a knee sprain and playing for a team with no shot at the playoffs, Johnson probably won't be rushed back to action before he has full confidence in his health. Things are trending toward another week of LeGarrette Blount and Theo Riddick leading the backfield Sunday at Arizona. Johnson (knee) has been ruled out for Sunday's game against the Rams, Tim Twentyman of the Lions' official site reports. Analysis: As expected, Johnson was unable to practice in any capacity this week and will be held out for a second straight game. Given that he's recovering from an MCL sprain, the rookie is far from a lock to make it back for Week 14 in Arizona. The Lions will rely on LeGarrette Blount and Theo Riddick out of the backfield as they try to pull off the upset Sunday. Johnson (knee) isn't participating in Friday's practice, Dave Birkett of the Detroit Free Press reports. Analysis: With Johnson having logged no on-field work this week, it's likely the Lions will list him as out for Sunday's game against the Rams when the team releases its final injury report later Friday. Johnson's expected absence for Week 13 should pave the way for LeGarrette Blount to handle the brunt of the carries for Detroit for the second straight contest. Johnson (knee) wasn't present for the media-access portion of Wednesday's practice, Tim Twentyman of the Lions' official site reports. Analysis: The running back is thus expected to open Week 13 as a non-participant in practice, which doesn't provide much early optimism with regards to his status for Sunday's game against the Rams. Johnson missed his first game of the season last week in the Lions' Thanksgiving Day loss to the Bears, allowing LeGarrette Blount (103 yards from scrimmage and two touchdown on 20 touches) to take on a more pronounced role out of the backfield. Johnson (knee) has been ruled out for Thursday's game against the Bears, Tim Twentyman of the Lions' official site reports. Johnson (knee) did not participate in practice again Tuesday, dave Birkett of the Detroit Free Press reports. Johnson (knee) is listed as a non-participant on Monday's estimated practice report, Dave Birkett of the Detroit Free Press reports. Johnson has been diagnosed with a knee sprain and is considered week to week, Adam Schefter of ESPN reports. Analysis: While not expected to require surgery, Johnson doesn't seem to have much chance at playing in Thursday's game against the Bears. His likely absence leaves the Detroit backfield in the hands of Theo Riddick, LeGarrette Blount and Zach Zenner -- a trio that doesn't exactly inspire confidence outside of highly specialized roles. With Marvin Jones (knee) also in danger of missing the Thanksgiving contest, Matthew Stafford and Kenny Golladay won't have much help against a stellar Bears defense. Although Johnson is slated for an MRI of his left knee Monday, the Lions believe the running back sustained a sprain and nothing more, Ian Rapoport of NFL Network reports. Analysis: If the MRI confirms a sprain, there's a chance Johnson won't miss much, if any time, but it'll have to be relatively minor to gain clearance with the Lions taking the field Thanksgiving, per usual. On the season, he's accrued 641 yards on the ground, 213 yards a receiver and four touchdowns total. Any absence would lead to a timeshare at running back between bruiser LeGarrette Blount and pass-catching option Theo Riddick. Johnson (knee) has been ruled out of Sunday's contest against the Panthers, Justin Rogers of The Detroit News reports. Analysis: The severity of the left knee injury isn't known, but the Lions won't risk any more Week 11 reps for the dynamic rookie. With Johnson out of commission, LeGarrette Blount will serve as the short-yardage back while Theo Riddick handles pass-catching duties. Johnson was forced out of Sunday's game against the Panthers with a knee injury, Michael Rothstein of ESPN.com reports. Analysis: Prior to his exit, Johnson had carried 15 times for 87 yards and a TD and caught two passes for 10 yards. Next up for the Lions' backfield touches in his absence are LeGarrette Blount and Theo Riddick. 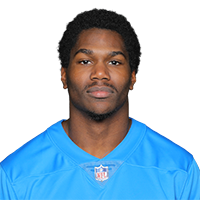 Johnson (ankle) rushed 14 times for 51 yards and a touchdown and brought in all six of his targets for 38 yards and another score in the Lions' 34-22 loss to the Bears on Sunday. He also lost a fumble. Johnson (ankle) is active for Sunday's game in Chicago. Johnson (ankle), who is listed as questionable for Sunday's game against the Bears, is expected to play, a source told Ian Rapoport of NFL Network. Johnson (ankle) remained limited at practice Friday and is listed as questionable for Sunday's game in Chicago. Johnson (ankle) was a limited participant in Thursday's practice, Tim Twentyman of the Lions' official site reports. Johnson was limited at Wednesday's practice due to an ankle injury. Johnson rushed 12 times for 37 yards and caught three of five targets for seven yards in Sunday's 24-9 loss to the Vikings. Analysis: Johnson got almost no push from the offensive line, which also allowed Matthew Stafford to get sacked 10 times. The rookie's 44 scrimmage yards were his lowest total since he was held to 37 in Week 1, and the return of receiving back Theo Riddick (seven catches for 36 yards) from his knee injury certainly played a role in this poor performance. Johnson will hope to get back on track in Chicago in Week 10. Johnson could lose out on passing-down work Sunday against the Vikings with teammate Theo Riddick (knee) cleared to play, Dave Birkett of the Detroit Free Press reports. Analysis: Johnson logged his two highest snap counts (38 and 48) of the season the past two weeks, taking advantage of Riddick's absence with a prominent role in passing scenarios. The veteran back's return puts Johnson at greater risk of disappearing when the Lions play from behind, but Riddick shouldn't have much impact on the rookie's rushing workload. There is potential for Week 9 disappointment, as the Lions are road underdogs against a Vikings team that allows just 3.7 yards per carry. Johnson gained 22 yards on eight carries and added 69 yards on six catches during Sunday's 28-14 loss to Seattle. Analysis: Johnson entered Sunday averaging over six yards per carry, but was bottled up by a stingy Seattle defense. However, Johnson was able to make up for it by having his best game of the season as a receiver, providing a dimension that he hadn't shown much of earlier this season. He might need to continue that receiving production next Sunday against Minnesota, as the Vikings are among the best in the league in stuffing opponents on the ground (3.7 yards per carry allowed). Johnson rushed for 158 yards on 19 carries and added 21 yards on two catches during Sunday's 32-21 win over Miami. Johnson (ankle) doesn't have an injury designation for Sunday's game at Miami, while backfield mate Theo Riddick (knee) has been ruled out, Michael Rothstein of ESPN.com reports. Johnson (ankle) was a full participant at Wednesday's practice. Analysis: Johnson downplayed his injury after the Lions' Week 5 win over the Packers and apparently had enough time to recover during the bye week. He'll lead the Detroit backfield Sunday in Miami and has the potential to handle some extra pass-catching work if Theo Riddick (knee) isn't able to play. Johnson (ankle) said "I'm fine" when he was asked about his injury following Sunday's 31-23 win over the Packers, ESPN.com's Michael Rothstein reports. Analysis: Johnson was removed early in the fourth quarter, finishing with 12 carries for 70 yards and two catches for 15 yards. It sounds like he might've been on the borderline for being able to return, but the Lions were fine with using LeGarrette Blount to run out the clock in the fourth quarter. Johnson will have some extra time to recover as Detroit prepares for a Week 6 bye. Johnson is questionable to return to Sunday's game against the Packers due to an ankle injury, Dave Birkett of the Detroit Free Press reports. 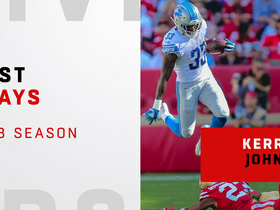 Johnson was not announced as one of the Lions' starting running backs for Sunday's game against the Lions, Kyle Meinke of MLive.com reports. Analysis: Johnson was credited with a start last week, but fellow running backs LeGarrette Blount and Theo Riddick were announced as the starters for Week 5. This should not have a major effect on Johnson's workload, though, as all three running backs will play a role in Sunday's contest. Coach Matt Patricia will continue to use Johnson in a platoon with LeGarrette Blount and Theo Riddick, Kyle Meinke of MLive.com reports. "I think we have a lot of really good running backs, and I think we try to use them appropriately," Patricia said Monday. "They're all outstanding players and we're just going to continually try to improve them, just like we are every position." Johnson carried nine times for 55 yards and a touchdown Sunday against the Cowboys. He also caught one pass for a one-yard gain in the 26-24 loss. Johnson rushed 16 times for 101 yards during Sunday's 26-10 victory over the Patriots. He added two receptions for nine yards on three targets. Johnson rushed a team-high five times for 17 yards and caught all three of his targets for 20 yards in Monday night's 48-17 loss to the Jets. Johnson took four carries for 25 yards and didn't draw any targets in Friday's preseason game at Tampa Bay. Analysis: Johnson came off the bench behind Blount and Ameer Abdullah, taking his first carry with about four minutes remaining before halftime. The rookie did at least make the most of his limited touches, bringing him to 15 carries for 68 yards -- along with five catches for 43 yards -- in three preseason games. Johnson figures to be involved Week 1 against the Jets, but he'll only be one piece of a three- or four-man committee. Johnson made his professional debut in Friday's preseason opener against the Raiders and gained 34 yards on seven carries while also securing four of five targets for 33 yards. Johnson has mostly been working with the backups during the opening days of training camp, Kyle Meinke of MLive Media Group reports. 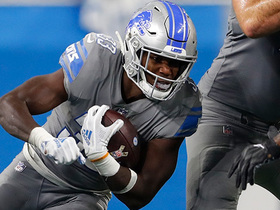 Watch Detroit Lions rookie running back Kerryon Johnson's best plays from his 2018 season. 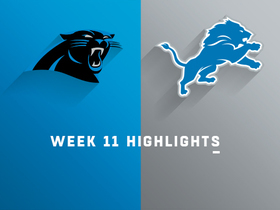 The Detroit Lions get a big receiving day from wide receiver Kenny Golladay and the defense stops the Carolina Panthers on a two-point conversion attempt to escape with a 20-19 victory in Week 11 of NFL action. Detroit Lions running back Kerryon Jones somehow gets through a tiny hole and speeds away from the defense for 24 yards. 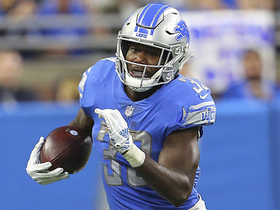 Detroit Lions running back Kerryon Johnson follows his blockers and skips into the end zone for an 8-yard touchdown. Detroit Lions running back Kerryon Johnson turns on the jets for a 13-yard touchdown. 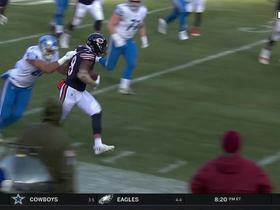 Chicago Bears safety Adrian Amos recovers Detroit Lions running back Kerryon Johnson's fumble. 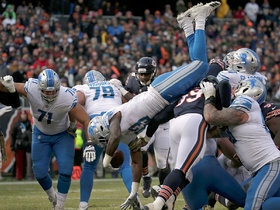 Detroit Lions running back Kerryon Johnson leaps over the offensive line for a 1-yard touchdown. NFL Network's Adam Rank and Marcas Grant take a look at some popular players on the start bubble for the week, and explain who needs to be locked into your lineup for Week 9.